it looks more intimidating than it actually is. 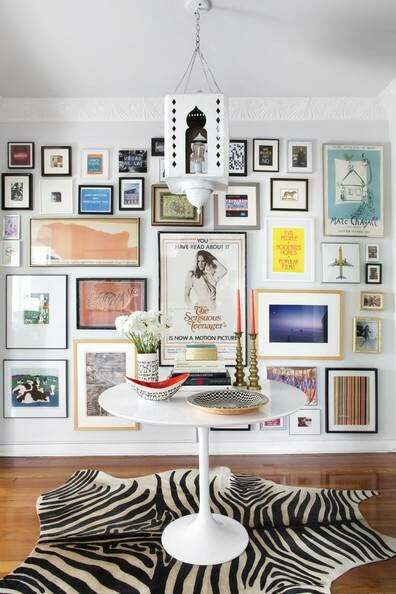 Building your own gallery wall is no small feat. Think about it. You have to collect a variety of prints, art, and maybe even original photography that speaks to you and nicely flows all together and works with the aesthetic of your room, home, and personal style. That’s all before anything even gets hung on the wall! But recently, people have really been rising to the challenge. Having already conquered the basic gallery wall, often placed above a sofa or bed, people are moving on to more inventive ways of grouping and hanging. Think leaning art on floating ledge shelves, adding 3D objects into the mix, and now, creating a gallery wall that spans from the floor all the way to the ceiling. Before you write this gallery wall off, hear us out. We chatted with Tessa Wolf, Creative Director of Framebridge (our favorite way to get our art custom framed), to get her advice on how to successfully create your own gallery wall that starts at your floor. Read on for all the tips and tricks you’ll need and we promise you won’t feel overwhelmed! Wolf confirmed that you should hang your floor to your ceiling gallery wall like you would any other. Choose a center focal point and build from there. If you’re struggling with conceptualizing what you want your wall to look like, taking a peek at these popular layouts might help. Pro tip: Wolf suggests instead of building your artwork out in a more radial design, think about building up and down in vertical groups. Hanging frames isn’t permanent—even though it sometimes feels like it. We created this video tutorial that easily shows how to fill those pesky little holes, which means you’re no longer trapped by the nails you’ve already tapped into the wall. You have the freedom to move pieces down if you find other pieces you love more and rearrange your heart out if you please. Wolf expressed that we should be thinking about our gallery walls (especially the large floor to ceiling variety) as a rotating or evolving display instead of a gallery that once hung, is never to be altered again. If you want all of your pieces to have equal face time, this might not be the type of gallery wall for you. Wolf pointed out that obviously, what is hanging at eye level (around 57 inches) will probably be seen first and the most. She suggests picking pieces that you want to be the center of attention to hang at eye level, and using the low space for either prints that may mean a bit less to you (if that’s even possible!) or instead using it as a space for bigger pieces to balance out smaller ones. Wolf said, “I love leaning giant frames, I think it’s such a good look,” and we couldn’t agree more. She added that leaning a few frames—instead of simply hanging them all—can add more dimension to an otherwise 2D wall. It can also be an easy way to balance out furniture placements or create asymmetry. Disclaimer: Leaning might not be so kid proof, but then again, neither is hanging art at a young child’s eye level. You might think the larger statement pieces that serve as the focal point of your wall are the MVPs, but you’re wrong. Wolf emphasized that the smaller frames not only add balance, spatially speaking, but can also be used to bridge gaps between the larger pieces (and vertical collections, if you choose to build out your wall with that method). Even though we often call the smaller pieces fillers (shhh! they don’t have to know), they really do play an important role in building the perfect gallery wall. Don’t feel like you have to fill up the largest wall in your house. Instead, choose a smaller space that maybe can’t fit anything else but a few small frames—or even a space that isn’t heavily trafficked. Staircases and the awkward space between two doors or windows are the perfect examples. Don’t limit yourself to what you’ve seen done before. Wolf referenced this photo as a creative example of not being afraid to use your art and frames in a truly interesting, out of the box way. By placing a credenza in front of a full wall of drawings and photos, the gallery wall becomes almost wallpaper-esque, as Wolf said, instead of the main focus.